Home / HACKING NEWS / NEWS / Security / Hacker Leaked Snapchat Source Code On GitHub !! Hacker Leaked Snapchat Source Code On GitHub !! Social Media app Snapchat is one of the most popular social media platforms in the world and millions of people are using this network to share amazing videos, snaps or media on this platform. 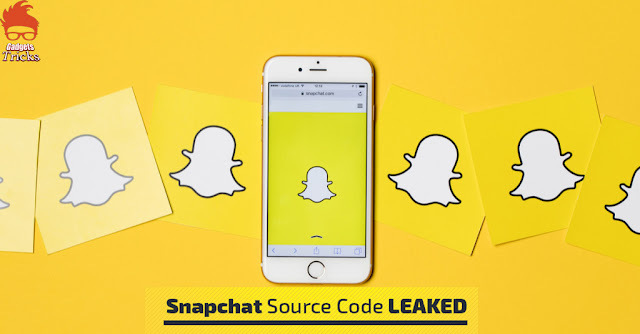 However, now according to the latest reports, recently a hacker managed to obtain the real Snapchat source code and leaked it on Github. The well-known Snapchat is a multimedia messaging app which is used globally and created by Evan Spiegel, Bobby Murphy, and Reggie Brown, the former students at Stanford University. Even a small piece of source code floating around the public domain raises the chances of a vulnerability being found at some point.the well-known multimedia messaging app, of course, Snapchat is one of the most popular social media platforms in the world and millions of people are using this network to share amazing videos, snaps or media on this platform, as we told earlier. Well, even we have previously seen that how the social network giant Facebook had also tried to adopt many things from the well-known multimedia messaging app, of course, Snapchat. Hence, at that time the CEO of the social network giant Facebook, of course, Mark Zuckerberg said that “we are not just going to build basic cameras, we’re going to build the first mainstream augmented reality platform”. The problem is that this social media platform can only be accessed through the applications installed on the smartphones and there is no way to access it through the computer devices yet. The part of the source code of its iOS app was recently released on GitHub and was available for any user to check and even for the copy as well. It is not clear how the i5xx user, who managed to get the app source code and published it on GitHub, but all the evidence indicates that it is real. The publication of this code is the culmination of a process that will drag on for some time, with several attempts to contact the well-known multimedia messaging application Snapchat teams to show the code obtained. By not getting this contact, the decision was made to publish the source code, in an attempt to draw the well-known multimedia messaging application Snapchat’s attention, something that would have been achieved immediately. To solve the problem, and remove the source code, Snap Inc., the company that owns the well-known multimedia messaging application Snapchat, will immediately have GitHub to remove the content under the DMCA (Digital Millennium Copyright Act), the law of US copyright. The well-known multimedia messaging app, of course, Snapchat has had a few complicated months, after having made changes in its visual that did not particularly please the users. This social network, which is also a messaging service, has sought to reverse the situation, but it has not been simple. However, now a new problem appears to be affecting this service, which has seen the source code for its iOS app published on GitHub after it has been obtained in an undisclosed way. The various sources that analyzed the code revealed that this is the same as Snapchat, associating the authors with the employees of the company and who developed the code. Although it has been removed, several copies of the code remain available on the Internet. Undergoing a complicated phase of its existence, the well-known multimedia messaging app, of course, Snapchat is now preparing to continue to have serious problems, this time security, and even its intellectual property.